If any individual deserves credit above all others for raising public awareness about the dangers of fossil fuel reliance, it might be Dr. James Hansen, who has been studying the issue intensely since the mid-seventies. He became the first scientist to testify about global warming in front of Congress 25 summers ago. And if there’s anyone who has taken bold steps in response to such warnings, it is the writer/activist Bill McKibben, who has helped organize a global network to rally support for addressing the problem. 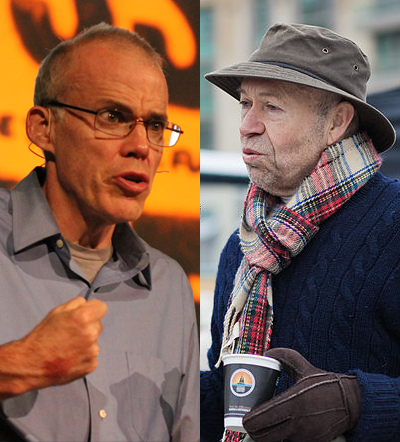 Both men have the arrest records to prove their dedication to the climate fight, so PLANET was interested in gaining their personal reactions to the summer that has so far seen boldface climate-related developments on a number of fronts. The season began with the first measurement of atmospheric carbon dioxide in excess of 400 parts per million, as recorded by NOAA researchers stationed in Hawaii. It also brought perhaps the most concrete plan of action yet by a sitting U.S. president to address the issue. Whether you’ve spent this summer of 400 ppm in the tornado-afflicted Great Plains, the fire-ravaged West, the rain-soaked Southeast, or under the oppressive heat dome that has covered much of the rest of the country, the news is bound to resonate.